... regarding Gunnison's authorship of the report in Vol. 2 of the Army's Pacific Railroad Survey, Gunnison was killed before ever reaching Salt Lake City in 1854. (He had been previously-1849-50 I believe-with the Stansbury expedition). How much of that report can be attributed to Gunnison is subject to doubt, but I believe what we read is properly credited to Beckwith, who had the time to write in while wintering in Salt Lake after Gunnison's death. "........Small Pox (cases?) are abated and I think from this time on we ought to be able to send a largely increased quantity (of wood) and ties to the front...."
".....the small pox scare is over...."
".....our track laying force were seized with a small pox (---?) the other day and became demoralized to a great extent no real cause for apprehension, but you can't reason with such men—no one has broken out lately, so we hope it will soon pass over." "....the small pox completely [immobilized] our track laying force and they could not have laid much more if they had it—as very nearly all the white men left the work and most of our best foremen also. We are breaking in the Chinese and learning them as fast as possible.........." and then ".......in the midst of trouble Stro (----?) sick with a very bad cold and afraid it was the small pox as the symptoms are very similiar. Men running off scared out of their senses. Two cases of small pox among the wood choppers at Elko-thermometer at 10° below zero..."
".... The small pox is abating at the end of the track—only one new case there last week, nearly all that died went into the pest cars, those that did not die increased the panic among the men more than those who died and "told no tales." Oakland Daily News, January 19, 1869. 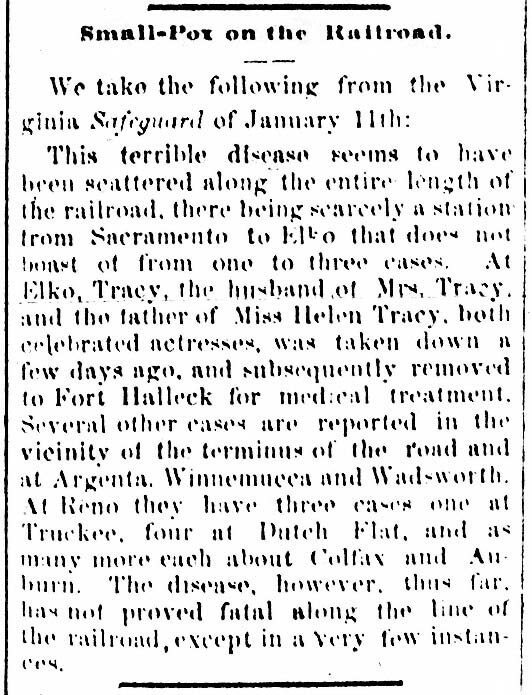 This terrible disease seems to have been scattered along the entire length of the railroad, there being scarcely a station from Sacramento to Elko that does not boast of from one to three cases. At Elko, Tracy, the husband of Mrs. Tracy and the father of Miss Helen Tracy, both celebrated actresses, was taken down a few days ago, and subsequently removed to Fort Halleck for medical treatment. Several other cases are reported in the vicinity of the terminus of the road and at Argenta, Winnemucca and Wadsworth. At Reno they have three cases one at Truckee, four at Dutch Flat, and as many more each about Colfax and Auburn. The disease, however, thus far, has not proved fatal along the line of the railroad, except in a very few instances. Courtesy of Wendell Huffman. Have you ever found much about Sacramento Valley shop facilities in Sacramento (I assume around R Street). I do have the map reprinted in the Western Railroader in a Sacramento Valley Railroad article, but that is for planned facilities, not already constructed. And when did they pull out from here and focus on Folsom for the shops? I'm gathering info on early Sacramento Shops. Another point – in the Sacramento County Historical Society's Golden Notes of Nov 1973 (Vol 19, No 4), pg 15 bottom, the claim is made that the CP trains leaving the depot continued to run out I Street to 6th, thence to the B Street levee until Feb. 26, 1870. This is supposedly based on Steve Helmich research that contradicts traditional lore. We all know this is the original route of the Central Pacific Railroad out of town, but 1870 seems VERY late for them to still be using that track for passenger service instead of the curve around the shops. The article has work starting on the route around the shops on Oct 16, 1866, which seems reasonable. Feb 26, 1867 might even be a reasonable completion date. But 1870??!! the line is clearly in place when the Houseworth photos are taken showing the shop fill being built and the back wall of the roundhouse under construction. I've tentatively dated this photo as Dec 1867 or Jan 1868 – plus or minus. Also, the map the CP prepared when trying to prevent the California Pacific Railroad from entering the City shows the I Street track cut at the Front Street end, but still connected at the B Street levee end at 6th. This map must date from late 1869, when the Cal P was building their new bridge (which is shown on the CP map). Have you come across anything? I also note that Dave Joslyn puts the Goss & Lombard foundry on the northEAST corner of I and 2nd Streets, this seemingly copied by all articles since then. But their ad lists them as being on I Street between Front and 2nd, which would be the north WEST corner – the site occupied now by the entrance to the California State Railroad Museum. How appropriate that the Governor Stanford locomotive, which was originally put together and set up for operations by Goss & Lombard, now sits where their shop used to be.